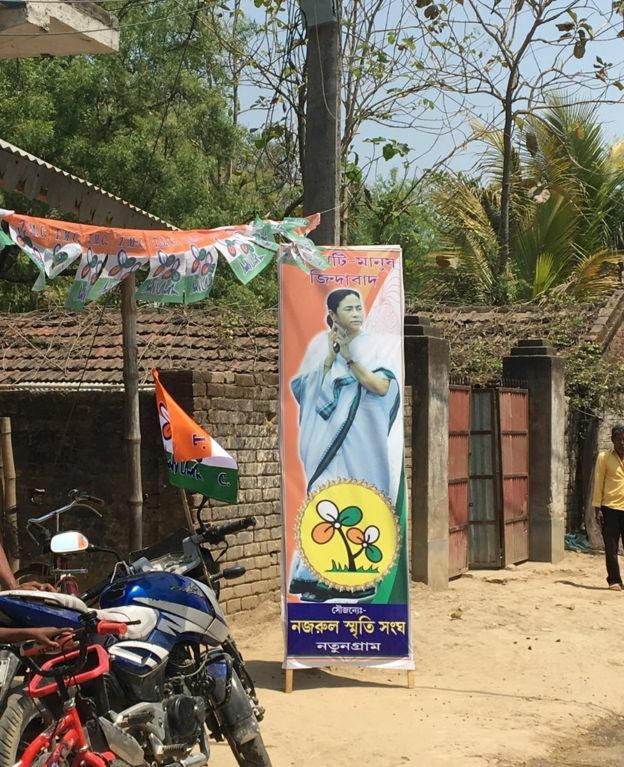 India election 2019: Can West Bengal’s female candidates win? 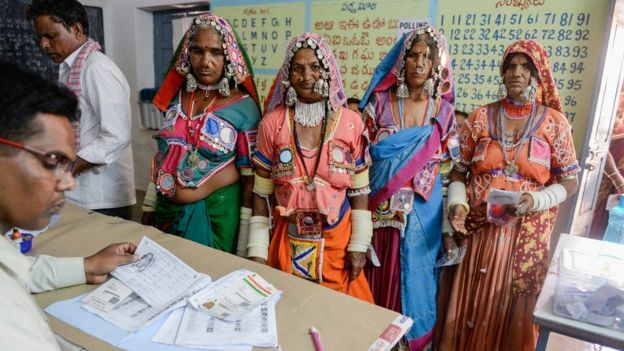 Women make up nearly half of India’s 900 million voters, but they are still poorly represented in the country’s law-making bodies. One political party is trying to correct the balance by nominating 41% female candidates. 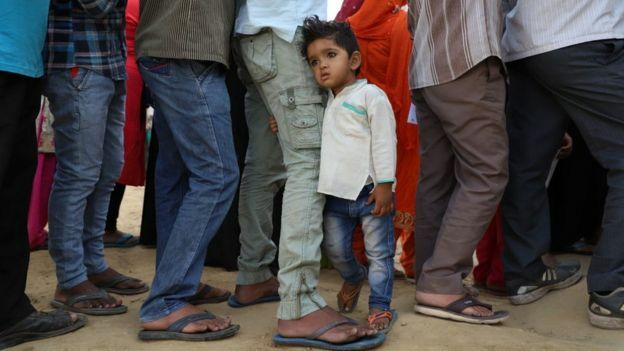 The BBC’s Geeta Pandey travelled to the state of West Bengal to see how they are faring. 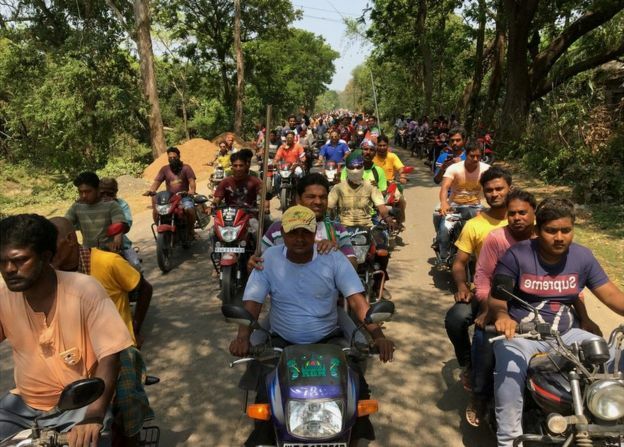 On a bright sunny morning, as an open jeep decorated with bright yellow and orange flowers hurtles along the dirt track from one village to the next, women in colourful saris and men rush to greet Mahua Moitra. Young men and women whip out their smartphones to take photos and selfies. On the way, she’s offered coconut water and sweets. 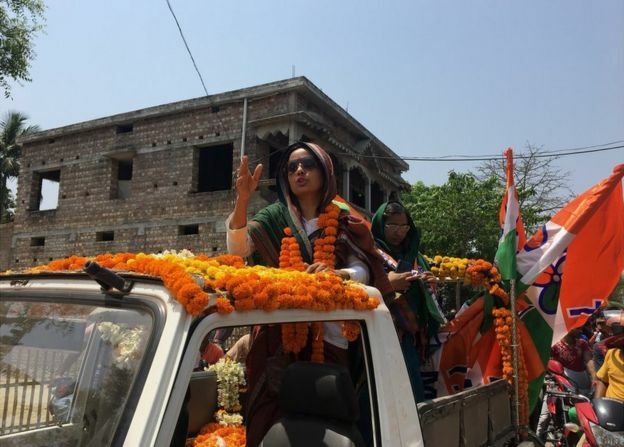 Ms Moitra, who is contesting the general election as a candidate of the state’s governing Trinamool Congress Party (TMC), is campaigning in her constituency Krishnanagar. In one village, party workers tell her about an old man who’s too ill to come to meet her, so she walks to his home to greet him. The loud, colourful procession is led by a small truck, fitted with loudspeakers, from which announcements asking people to vote for Ms Moitra are played on a loop. With the election season well under way in India and political leaders criss-crossing the length and breadth of the country, addressing rallies, I’m travelling across the country to see if the high-decibel campaigns are addressing the real issues that actually affect millions of people. One of them is getting more women into parliament. In India, only 11% of members of parliament are women, and in state assemblies it’s 9%. In a list of 193 countries this year, India was ranked 149th for female representation in parliament – below Pakistan, Bangladesh and Afghanistan. A bill to reserve 33% of seats for women in parliament and regional assemblies has been pending since 1996, so the decision by the TMC – led by West Bengal Chief Minister Mamata Banerjee – to give 41% of her party nominations to women has created a huge buzz. Ms Banerjee, who set up the TMC in 1998 after falling out with the Congress party, is a feisty politician who was named one of Time magazine’s 100 most influential people in the world in 2012. 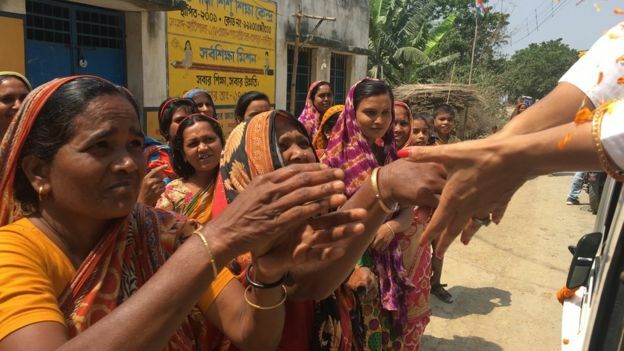 Her female candidates, says my BBC Bengali colleague Subhajyoti Ghosh, are an “interesting mix” of career politicians and first-timers. They include actors, doctors, a tribal activist and the 25-year-old widow of a recently-murdered politician. 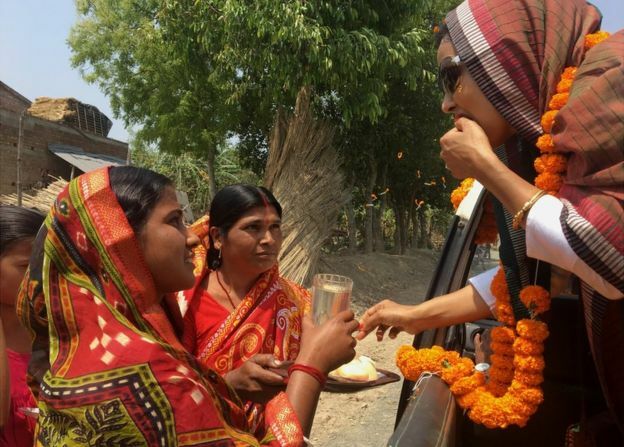 Ms Moitra, the TMC’s national spokesperson and a member of the state assembly since 2016, is among 17 women who have made it to the party’s list of 42 general election nominees. Why does Indian PM Narendra Modi follow trolls on Twitter? A former investment banker with JP Morgan, she gave up a well-paying job in London in 2009 to return to the heat and dust of Indian politics. Her decision left her family aghast. Her parents, she told me, thought she was “insane”. Some party workers too had their doubts – “she’s a memsahib”, they said at the time, “she won’t survive”. But she has survived – and thrived. 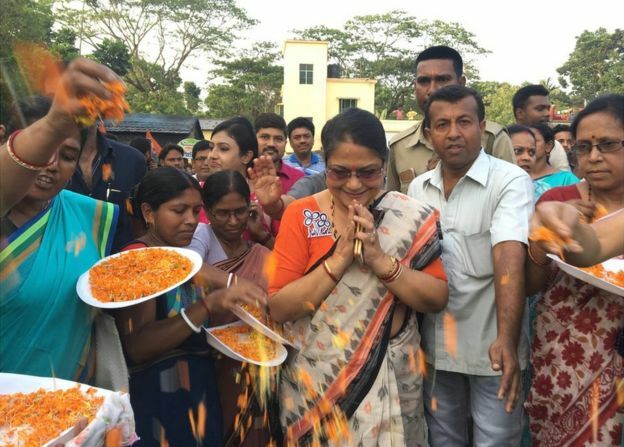 In 2016, she won the Karimpur assembly seat that no non-Left party had won since 1972 and has now set her eyes on the national parliament. She’s agreed to let me follow her on the campaign trail, so for two days I’ve been a “fly on the wall” – standing behind her in her jeep, travelling in her car, watching her strategise with party workers, aides and confidants. The previous evening, I had watched her be the chief guest at a college cricket match and address a gathering at the local market in Plassey. A four-hour drive from Kolkata, Plassey is the site of the famous 1757 battle between the British East India Company and the local ruler supported by the French. Ms Moitra takes her spot to speak and clearly takes aim at Prime Minister Narendra Modi and his Bharatiya Janata Party (BJP) as she talks about a deadly suicide attack in Kashmir and India’s subsequent air raid in Pakistan. She talks about how the government has failed to create jobs and accuses the BJP of trying to divide Hindus and Muslims. “You have taken away our livelihoods and you’re trying to teach us about [the Hindu god] Ram and [Muslim saint] Rahim? I don’t have to write my religion on my forehead,” she declares to loud claps from her supporters. Kakoli Ghosh Dastidar, a founder member of the TMC and two-term MP, says to nominate so many women is part of a “continuous process” followed by Mamata Banerjee because “you can’t develop a society without uplifting the status of its women”. In the last general election in 2014, she points out that the party nominated 33% women and 12 of their 34 MPs in the outgoing lower house were women. Ms Banerjee, she says, believes that gender sensitive laws will come only if more women are in power. At a campaign rally that Dr Ghosh Dastidar addresses in Kumhra Kashipur village in her constituency Barasat, women are seated in the front rows. Their opinion though is divided over whether having more women in parliament will actually benefit other women. 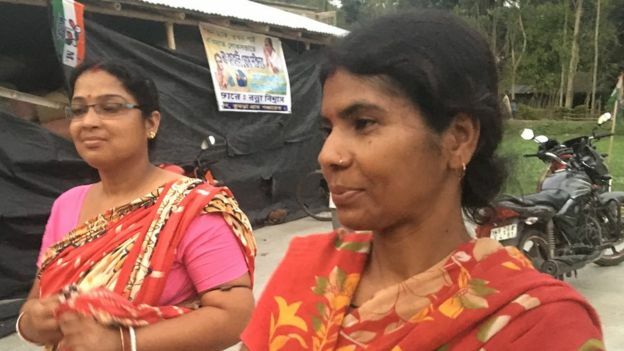 Archana Mallick and Meena Mouli, who live just across from the rally ground, point to the broken roads near their homes and complain about poor medical facilities in their village. They say that the candidate’s gender is “inconsequential” and what’s important is “who works for our benefit”. Studies, however, show that female representatives bring economic growth to their constituencies because they are more concerned than men about issues such as water supply, electricity, road connectivity and health facilities. Saswati Ghosh, professor of economics at Kolkata’s City College, says that politics in India is “still very patriarchal” and it’s “absolutely necessary” to elect more women MPs. Critics, however, question whether celebrities are the right candidates to bring about that change. Prof Ghosh says actors and celebrities make for “winnable candidates” and that’s why all parties choose them even though sometimes they may not be the right candidates to reach that threshold. But, she says that Ms Banerjee is a strong leader who’s regarded by many women as “a role model who inspires more women to come into politics”. And that’s something that many Indians think the country sorely needs. In their manifestos, the main opposition Congress party has promised to pass the women’s reservation bill, if elected to power. So has the ruling Bharatiya Janata Party, although it had made similar promises in its last manifesto and did nothing about it. By allotting 41% seats to women, Ms Banerjee has shown that one doesn’t need to set artificial quotas to elect more women. On April 13, 1919, some 50 British Indian army soldiers began shooting at unarmed civilians who were taking part in a peaceful protest against oppressive laws enforced in the Punjab region. At least 379 Sikhs were killed, according to the official record, although local residents said in the past the toll was far higher. The massacre took place in the walled enclosure of Jallianwala Bagh, which is still pocked with bullet marks. The massacre became a symbol of colonial cruelty and for decades Indians have demanded an apology from Britain, including during Queen Elizabeth’s visit to Amritsar in 1997. On Wednesday, May told the British parliament that “the tragedy of Jallianwala Bagh in 1919 is a shameful scar on British Indian history”, but she did not issue a formal apology. In 2013, then British Prime Minister David Cameron described the killings as a “deeply shameful event” in a visitor book at the site, now marked by a 46-foot (14-metre) high flame-shaped memorial. “There are events in the histories of nations which are difficult to forget and they hold a very emotionally charged space in a nation’s memory,” Navtej Sarna, a Sikh who has served as India’s High Commissioner to the United Kingdom, told Reuters. “We have an excellent relationship with the United Kingdom today but it’s a question of assuaging sentiments and healing a wound which has been festering as part of our shared history.” India gained independence from Britain in 1947. Security in the city – also home to Sikhism’s holiest shrine the Golden Temple – has been stepped up as hundreds of visitors and groups are likely to arrive at the site, Amritsar Police Commissioner S.S. Srivastava said. Residents of the city, tourists, visitors, top government officials and students took part in the candle lit evening march from a building called Townhall to the massacre site. The march of about one kilometre was accompanied by loudspeakers playing patriotic songs and onlookers thronged the roadsides. At the end of the march, people observed a two-minute silence. Punjab state’s Chief Minister Amarinder Singh and Governor V P Badnore took part in the march while Rahul Gandhi, president of the opposition Congress party, was expected to visit the city later in the evening. Tens of millions of Indians across 20 states and union territories are voting in 91 constituencies. With 900 million eligible voters across the country, this is the largest election ever seen. Some observers have billed this as the most important election in decades and the tone of the campaign has been acrimonious. Mr Modi’s Hindu nationalist Bharatiya Janata Party (BJP) won a historic landslide in the last elections in 2014. He stakes his claim to lead India on a tough image and remains the governing BJP’s main vote-getter. But critics say his promises of economic growth and job creation haven’t met expectations and India has become more religiously polarised under his leadership. The BJP faces challenges from strong regional parties and a resurgent Congress party, led by Rahul Gandhi. Mr Gandhi’s father, grandmother and great-grandfather are all former Indian prime ministers. His sister, Priyanka Gandhi, formally joined politics in January. How has voting gone so far? The Lok Sabha, or lower house of parliament has 543 elected seats and any party or coalition needs a minimum of 272 MPs to form a government. Hundreds of voters began to queue up outside polling centres early Thursday morning. In the north-eastern state of Assam, lines of voters began forming almost an hour before voting officially began. 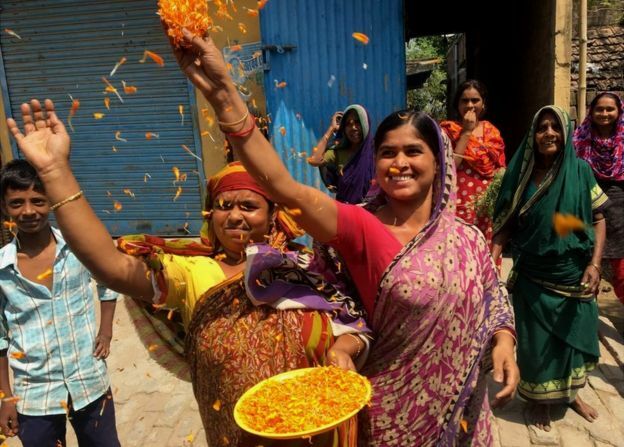 Voters at one polling booth in Baraut – in the northern state of Uttar Pradesh – got a royal welcome with people greeted by drums and a shower of flower petals. But violence has flared in several places already. One person has died after clashes erupted at a polling station in Anantpur, in southern Andhra Pradesh state. Four others were critically injured in the fight that broke out between workers from two parties, BBC Telugu reports. In central Chhattisgarh state, suspected Maoists detonated an IED device near a polling booth at around 04:00 local time (23:30 BST) – no injuries were reported. The mineral-rich state has witnessed an armed conflict for more than three decades and attacks by Maoist rebels on security forces are common. On Tuesday a state lawmaker was killed in a suspected rebel attack. How big is this election? It is mind-bogglingly vast – about 900 million people above the age of 18 will be eligible to cast their ballots at one million polling stations. At the last election, vote turn-out was around 66%. More than 100 million people are eligible to vote in the first phase of the election on Thursday. No voter is meant to have to travel more than 2km to reach a polling station. Because of the enormous number of election officials and security personnel involved, voting will take place in seven stages between 11 April and 19 May. India’s historic first election in 1951-52 took three months to complete. Between 1962 and 1989, elections were completed in four to 10 days. The four-day elections in 1980 were the country’s shortest ever. 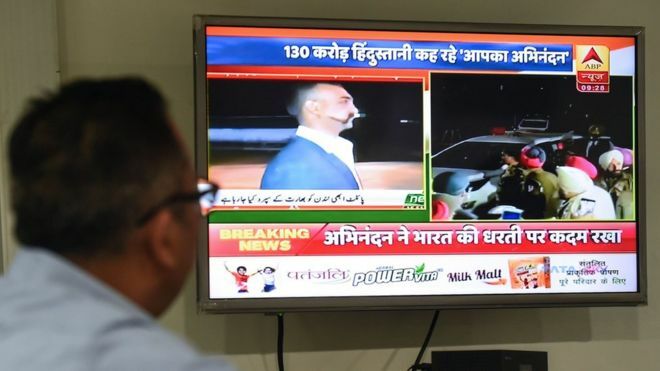 As tensions between India and Pakistan escalated following a deadly suicide attack last month, there was another battle being played out on the airwaves. Television stations in both countries were accused of sensationalism and partiality. But how far did they take it? The BBC’s Rajini Vaidyanathan in Delhi and Secunder Kermani in Islamabad take a look. It was drama that was almost made for television. 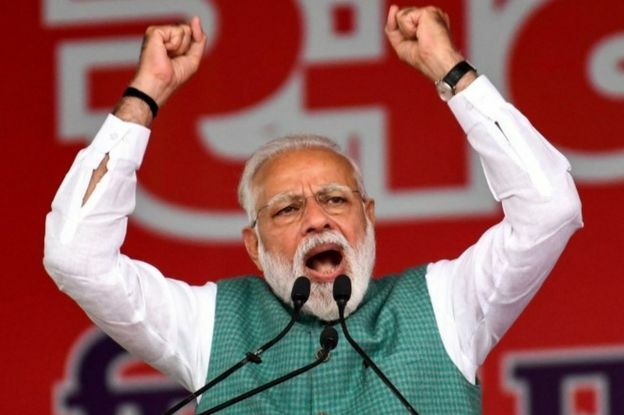 The relationship between India and Pakistan – tense at the best of times – came to a head on 26 February when India announced it had launched airstrikes on militant camps in Pakistan’s Balakot region as “retaliation” for a suicide attack that had killed 40 troops in Indian-administered Kashmir almost two weeks earlier. A day later, on 27 February, Pakistan shot down an Indian jet fighter and captured its pilot. 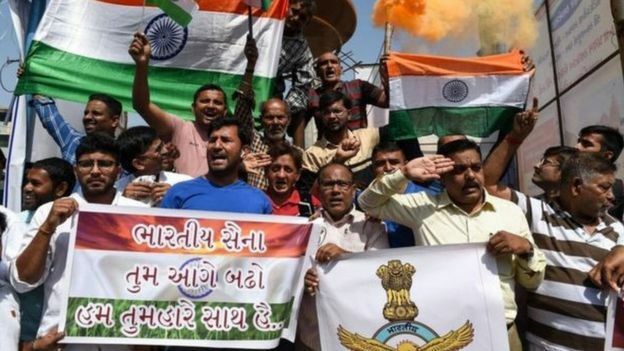 Abhinandan Varthaman was freed as a “peace gesture”, and Pakistan PM Imran Khan warned that neither country could afford a miscalculation, with a nuclear arsenal on each side. Suddenly people were hooked, India’s TV journalists included. Modi vs Khan: Who won the propaganda battle? So were they more patriots than journalists? Rajini Vaidyanathan: Indian television networks showed no restraint when it came to their breathless coverage of the story. Rolling news was at fever pitch. The coverage often fell into jingoism and nationalism, with headlines such as “Pakistan teaches India a lesson”, “Dastardly Pakistan”, and “Stay Calm and Back India” prominently displayed on screens. Some reporters and commentators called for India to use missiles and strike back. One reporter in south India hosted an entire segment dressed in combat fatigues, holding a toy gun. And while I was reporting on the return of the Indian pilot at the international border between the two countries in the northern city of Amritsar, I saw a woman getting an Indian flag painted on her cheek. “I’m a journalist too,” she said, as she smiled at me in slight embarrassment. Print journalist Salil Tripathi wrote a scathing critique of the way reporters in both India and Pakistan covered the events, arguing they had lost all sense of impartiality and perspective. “Not one of the fulminating television-news anchors exhibited the criticality demanded of their profession,” she said. Secunder Kermani: Shortly after shooting down at least one Indian plane last week, the Pakistani military held a press conference. As it ended, the journalists there began chanting “Pakistan Zindabad” (Long Live Pakistan). It wasn’t the only example of “journalistic patriotism” during the recent crisis. 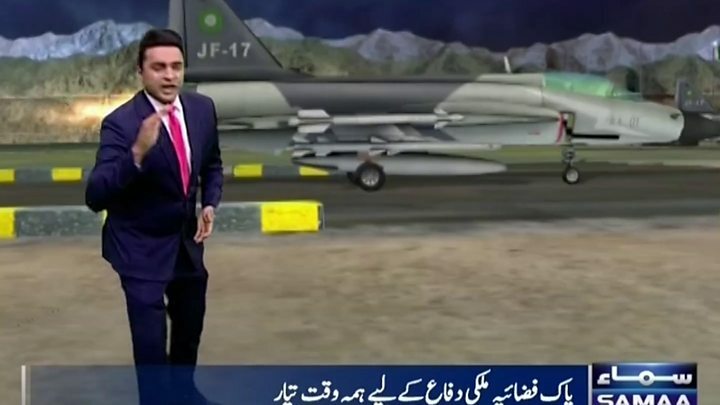 Two anchors from private channel 92 News donned military uniforms as they presented the news – though other Pakistani journalists criticised their decision. But on the whole, while Indian TV presenters angrily demanded military action, journalists in Pakistan were more restrained, with many mocking what they called the “war mongering and hysteria” across the border. In response to Indian media reports about farmers refusing to export tomatoes to Pakistan anymore for instance, one popular presenter tweeted about a “Tomatical strike” – a reference to Indian claims they carried out a “surgical strike” in 2016 during another period of conflict between the countries. Rajini Vaidyanathan: As TV networks furiously broadcast bulletins from makeshift “war rooms” complete with virtual reality missiles, questions were raised not just about the reporters but what they were reporting. In recent years in fact, a handful of commentators have complained about the lack of critical questioning in the Indian media. Senior defence and science reporter Pallava Bagla agreed. “The first casualty in a war is always factual information. Sometimes nationalistic fervour can make facts fade away,” he said. 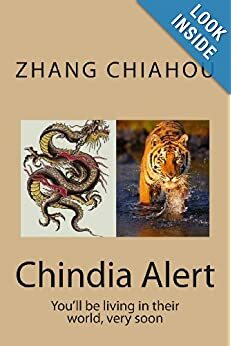 This critique isn’t unique to India, or even this period in time. During the 2003 Iraq war, western journalists embedded with their country’s militaries were also, on many occasions, simply reporting the official narrative. Secunder Kermani: In Pakistan, both media and public reacted with scepticism to Indian claims about the damage caused by the airstrikes in Balakot, which India claimed killed a large number of Jaish-e-Mohammad (JeM) militants in a training camp. 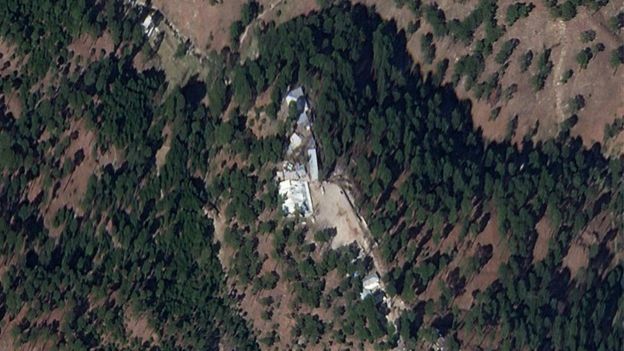 There seems to be no evidence to substantiate Indian claims that a militant training camp was hit, but other journalists working for international outlets, including the BBC, found evidence of a madrassa, linked to JeM, near the site. A photo of a signpost giving directions to the madrassa even surfaced on social media. It described the madrassa as being “under the supervision of Masood Azhar”. Mr Azhar is the founder of JeM. The signpost’s existence was confirmed by a BBC reporter and Al Jazeera, though by the time Reuters visited it had apparently been removed. Despite this, the madrassa and its links received little to no coverage in the Pakistani press. Media analyst Adnan Rehmat told the BBC that “there was no emphasis on investigating independently or thoroughly enough” the status of the madrassa. In Pakistan, reporting on alleged links between the intelligence services and militant groups is often seen as a “red line”. 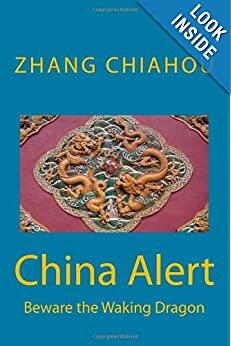 Journalists fear for their physical safety, whilst editors know their newspapers or TV channels could face severe pressure if they publish anything that could be construed as “anti-state”. Who did it better: Khan or Modi? 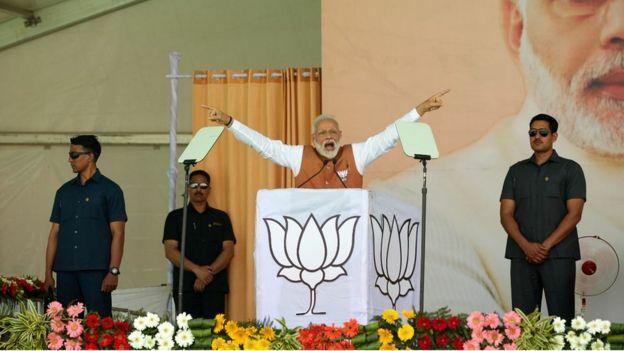 Rajini Vaidyanathan: With a general election due in a few months, PM Narendra Modi continued with his campaign schedule, mentioning the crisis in some of his stump speeches. But he never directly addressed the ongoing tensions through an address to the nation or a press conference. This was not a surprise. Mr Modi rarely holds news conference or gives interviews to the media. 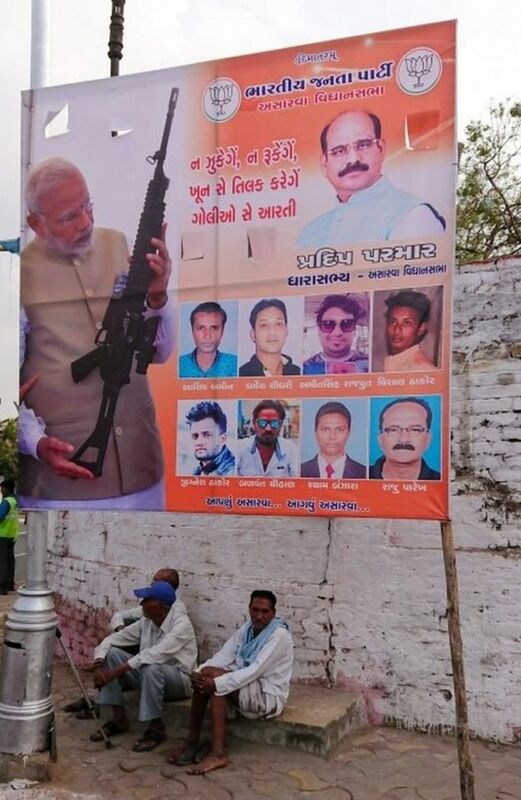 When news of the suicide attack broke, Mr Modi was criticised for continuing with a photo shoot. The leader of the main opposition Congress party, Rahul Gandhi, dubbed him a “Prime Time Minister” claiming the PM had carried on filming for three hours. 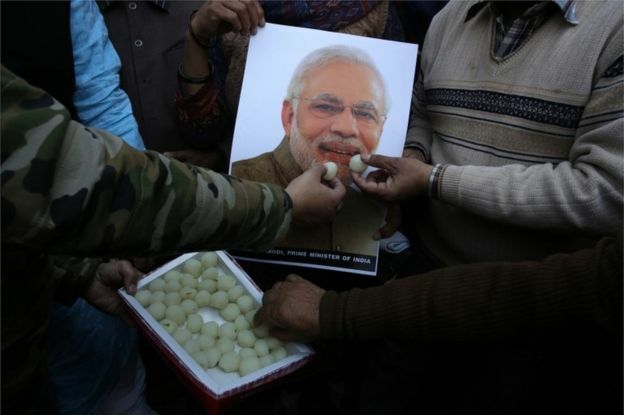 PM Modi has also been accused of managing his military response as a way to court votes. 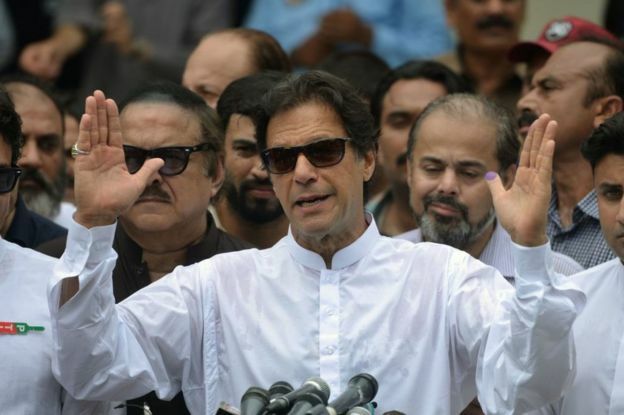 Secunder Kermani: Imran Khan won praise even from many of his critics in Pakistan, for his measured approach to the conflict. In two appearances on state TV, and one in parliament, he appeared firm, but also called for dialogue with India. His stance helped set the comparatively more measured tone for Pakistani media coverage. Officials in Islamabad, buoyed by Mr Khan’s decision to release the captured Indian pilot, have portrayed themselves as the more responsible side, which made overtures for peace. On Twitter, a hashtag calling for Mr Khan to be awarded a Nobel Peace Prize was trending for a while. But his lack of specific references to JeM, mean internationally there is likely to be scepticism, at least initially, about his claims that Pakistan will no longer tolerate militant groups targeting India.